Conservatives are losing the culture war when, according to a 2011 Pew Research poll, 49% of Americans ages 18-29 have a positive view of socialism while just 46% have a positive view of capitalism. Such views are the products of our education system and the movies, music and entertainment young Americans consume. We must change those cultural institutions before we can truly change our political institutions in the long term. This seems to expand on the Republican Narrative: not only is our President a Socialist, but now most of the population is too!. It's a powerful message, and will certainly reinforce the notion that half the country is living a flawed ideology. My first instinct is to think - huh, really? I can't imagine most of the population even understands the nuances of what socialism really is (I know I certainly don't), and while capitalism without controls is unreliable, nobody I know is advocating that. While I was skeptical, the article linked to this poll as proof. 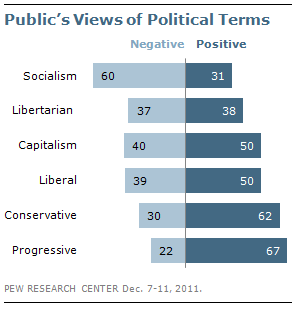 Of these terms, socialism is the more politically polarizing – the reaction is almost universally negative among conservatives, while generally positive among liberals. Whoa. You're telling me that all this poll measured was how much people like the term socialism. That's it? In other words, when I say the word "capitalist" do you imagine a young, female business owner or the character from Monopoly. That tells you something, but not all that much. Just who's winning the war on terminology. I'll give Bennett, the author of the CNN article, some credit. He found a poll that could support the narrative he wants to provide. Unfortunately, it still doesn't prove that his narrative has any resemblance to reality.